The Ribbon cast iron radiator features a Celtic band pattern gracefully flowing down the radiator and is part of our traditional radiators range manufactured by Carron and come with a lifetime guarantee. The Ribbon 4 column makes a bold statement and is unique in the marketplace. We can vouch for its weight as we have one in pride of place at the entrance to our showrooms. 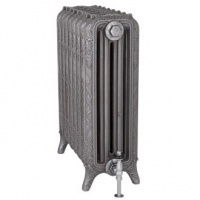 Cast Iron Radiators have the distinct benefit in that they retain the heat long after your central heating has gone off, as well as looking great and creating a feature in your home. Our sales team have extensive knowledge and are always available to answer any questions you have in relation to any of our Cast Iron Radiators. We always monitor our emails or you can call us on 01748 821500.